Synthetic peptide conjugated to KLH derived from within residues 100 - 200 of Human YY1. Our Abpromise guarantee covers the use of ab43058 in the following tested applications. WB Use a concentration of 1 - 2 µg/ml. Detects a band of approximately 58 kDa (predicted molecular weight: 45 kDa). IHC-P Use a concentration of 5 µg/ml. Perform heat mediated antigen retrieval before commencing with IHC staining protocol. Multifunctional transcription factor that exhibits positive and negative control on a large number of cellular and viral genes by binding to sites overlapping the transcription start site. May play an important role in development and differentiation. The function of YY1 as an activator or a repressor is specified by the presence of other proteins. For example it acts as a repressor in absence of adenovirus E1A protein but as an activator in its presence. Belongs to the YY transcription factor family. Contains 4 C2H2-type zinc fingers. Nucleus matrix. Associated with the nuclear matrix. Additional bands at: 85 kDa. We are unsure as to the identity of these extra bands. 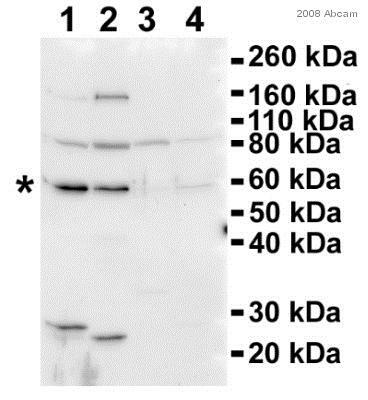 The band observed at 58 kDa is consistent with the banding pattern seen in other commercially available antibodies to YY1. ICC/IF image of ab43058 stained human HEK 293 cells. The cells were 4% PFA fixed (10 min), permabilised in 0.1% PBS-Tween (20 min) and incubated with the antibody (ab43058, 1µg/ml) for 1h at room temperature. 1%BSA / 10% normal goat serum / 0.3M glycine was used to block non-specific protein-protein interactions. The secondary antibody (green) was Alexa Fluor® 488 goat anti-rabbit IgG (H+L) used at a 1/1000 dilution for 1h. Alexa Fluor® 594 WGA was used to label plasma membranes (red). DAPI was used to stain the cell nuclei (blue). This antibody also gave a positive IF result in HeLa, HepG2 and MCF7 cells. IHC image of YY1 staining in human breast carcinoma FFPE section, performed on a BondTM system using the standard protocol F. The section was pre-treated using heat mediated antigen retrieval with sodium citrate buffer (pH6, epitope retrieval solution 1) for 20 mins. The section was then incubated with ab43058, 5µg/ml, for 8 mins at room temperature and detected using an HRP conjugated compact polymer system. DAB was used as the chromogen. The section was then counterstained with haematoxylin and mounted with DPX. Publishing research using ab43058? Please let us know so that we can cite the reference in this datasheet.